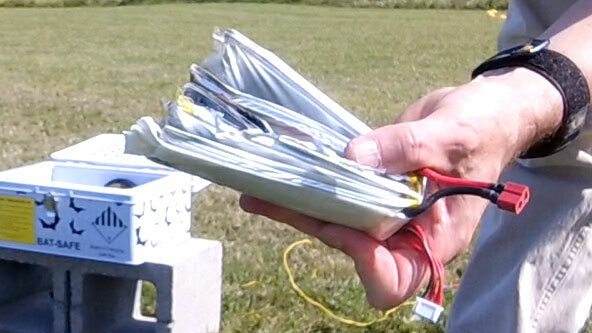 We’ve discussed how LiPo batteries explode. But how volatile or stable are they, and what’s the best way to protect yourself? At the 2017 Champlain Mini Maker Faire, we conducted a series of tests and demonstrations using different battery containers. Bottom line: not all containers are created equal. You need to choose the right one for your situation. For our test, we gathered a budget LiPo Safe bag, the community favorite .50 caliber ammunition container, and set them against the BAT-SAFE. First, we collected batteries bound for disposal. These donor batteries all had some issue that was keeping them from service: usually puffed, out of balance, or a dead cell. I’m calling these batteries “Racer-sized” for short: for the most part, they were 3S or 4S, 1000–2200mAh, though some were smaller or larger. We run our tests across two days at the Maker Faire, doubling as a live demonstration to go with our safety talk and display. In each case, we balance charged the trigger battery up to 4.2V per cell. On Saturday, we physically breached the cells. On Sunday, we continuously overcharged batteries until the point of failure. This was a controlled test with oversight and approval from local fire officials. Many safety measures were taken before, during, and after testing. Do not attempt to replicate these tests on your own. 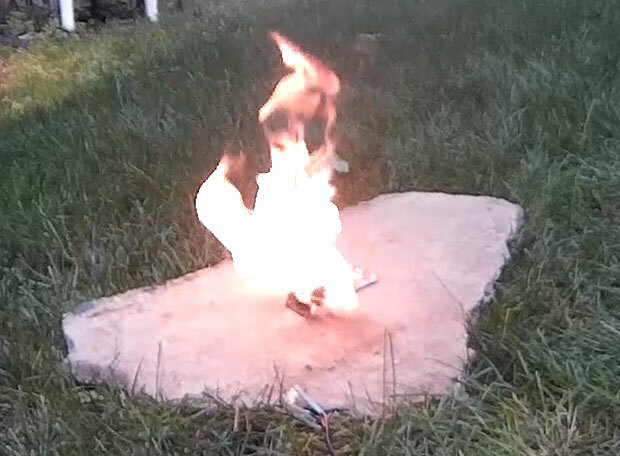 This fire was provoked from a single LiPo cell simply by breaching the cell wall. This was not an overcharge. Before our test could get underway, we needed to make sure we had a reliable way to breach the cell walls that could be undertaken inside a container. It took some ingenuity to devise a solution, but eventually we were able to do it. This pre-test phase gave us the opportunity to see a cell breach in open air, and should give pause to anyone who hasn’t taken battery safety seriously. This battery is not on fire, despite having just been forcibly opened by a quick nearby ignition. Saturday’s tests and demonstrations were anticlimactic. Despite what we saw the cell capable of, none of the test batteries on Saturday would ignite. We successfully breached the cells in each test, but the battery did not smoke or produce flame. This is actually a vote of confidence for storing LiPos—they appear to be pretty stable and it’s difficult to provoke a fire. It takes more than a cell breach and exposing oxygen to the cell innards to ignite. We even used a secondary breaching method of a small ignition charge immediately next to the cells. This too breached the cell wall without setting it on fire. Don’t take this to mean the cells are stable in storage—the same methods did cause fires in our pre-test—but we’ll sleep a little easier knowing the odds might be somewhere around one in six if something causes it to break open in storage. A battery is more volatile during charging, likely because it is undergoing a chemical reaction. Overcharging a battery was a far more reliable way to cause it to ignite; we had a 100% success rate. That’s something to keep in mind when selecting settings on your charger. There is a serious risk of fire if you enter your settings incorrectly, or if your charger fails. It took less than 10 minutes in our tests to get a full cell to cause a fire by overcharging. Here’s our test footage, including review commentary beginning at 14:15. Our LiPo Safe bag was an inexpensive option from Amazon. This is a bag for three or four racer-sized batteries, but potentially could be packed with six. We used three for our test, triggering with a 4S 1000mAh. It’s a pretty modest test of a smaller battery. The result was almost a complete failure. The bag did prevent actual flame from escaping—we’ll give it that. Beyond that, things get ugly. The top, side, back, and bottom were badly melted and damaged. The bag did not contain the heat at all. While we didn’t see a hole all the way through, it’s obvious that anything nearby would also have been damaged or began to combust. The bag would not protect the surface it was sitting on and caused significant blackening to our cinder block test pad. In the video, you can watch the bag puff up over time during the charge, then hear a pop when a cell ruptures. The bag immediately settles back into shape and generates quite a bit of smoke. It’s hard to watch the bag fail from this angle, but take a look as soon as the cover is opened. The other batteries alongside the trigger battery did not fully ignite, but the heat caused each of them considerable distress. A larger trigger battery or slightly different positioning in the bag might have caused a chain reaction. 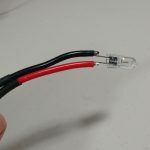 Your tiny whoop batteries might be safe in one of these, but these LiPo bags are NOT a usable containment option for typical acro/racing batteries. Here’s our test footage, including review commentary beginning at 8:05. Next we tested an ammo can, undoubtedly the most common community solution. The ammo can will hold a lot of batteries and potentially even your charger, but you have to prepare it ahead of time. Off the shelf, the box will be sealed to prevent the contents from getting wet. Keeping it that way is extremely dangerous. Expanding gases from a LiPo fire will pressurize the box, creating a situation where it might violently explode. We removed the lid seal on our box and also drilled and sanded a hole for our charge leads. We used about four and a half batteries in this test (there were some remaining charged cells from Saturday). This burn didn’t escape the container, but it could have gotten a lot worse. The ammunition container also prevented any flame from escaping in this test, and again produced a lot of smoke. For this test we were able to measure the surface temperature, which rose to about 120°C/250°F. That’s enough to boil water and cause a serious burn, but not enough to outright ignite most other materials. Still, not many of the other batteries in the box chained off our small trigger battery, and absorbed some of the heat. Had they burned, the surface temperature would have been much hotter. Since nothing prevents the bottom of the box from touching the floor, there would definitely be surface damage there. The most notable features of this video are the surface thermometer and the commentary. You can hear cell breaches and see resulting smoke puffs escaping through the hinge and unsealed lid. The ammunition container could be a low-cost solution if prepared and used properly. It did successfully contain the flame, but gave off considerable heat. You’ll want to keep it well-isolated, and have a heat barrier between it and anything sensitive. The can does nothing to prevent smoke and smoke damage could easily result in the area, so use and store it somewhere well-ventilated. Here’s our test footage, including review commentary beginning at 3:30. Our final test wraps up the last part of our BAT-SAFE review. We did want to push the limits of this box a bit more, so we loaded it up with 15 batteries. 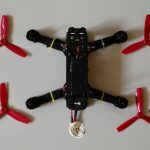 We’re still nowhere near the heat and strength that two 6S 5000mAh batteries would produce, but this is a very reasonable test for the kinds of batteries that acro pilots and racers will be using. There’s a definite edge where the box seal closes. The green color might be plastic battery wrap that vaporized; we’re not sure. We are extremely impressed at how well the box handled the test. Again, there was no flame outside the box. Despite having more than three times the fuel of either previous test, only a few short puffs of smoke escaped. The surface temperature rose about 10 degrees. Opening the box reveals that we did cause the most batteries to burn in this test, and that they burned pretty strongly to begin with. Things to watch for in this video are much more subtle. You can hear cells pop at 0:07 and again at 0:17, but the first smoke plume doesn’t begin until 0:40. The plumes last only about 10 seconds, not drawn out like the other containers. The surface temperature barely rises at all during this time; the 10 degree increase can be seen when we jump cut to several minutes later for reviewing the aftermath. 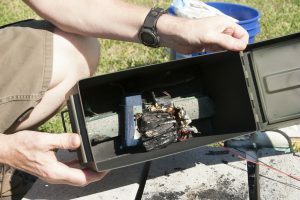 When we pop open the box, the batteries are still smoking, even though nothing appeared to be happening from the outside. A truly significant fire event was reduced to almost nothing. The flame was contained, the heat was contained, and much of the smoke was contained. The filter reduces the soot in the smoke: after the burn, the lid of the BAT-SAFE was clean while the vents on the ammo can were blackened. 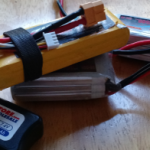 Don’t use a cheap LiPo Safe bag for typical racing batteries. Our test bags offered almost no protection at all. An ammunition box can be a viable containment option, but there are some important caveats. You need to make sure it is not sealed, place it on a non-combustible surface, keep it isolated on all sides away from any sensitive materials, and use it in a well-ventilated area where nearby items won’t be damaged by smoke. If you can do this, it can be safe and cost-effective. 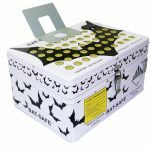 Of the three containers we tested, the BAT-SAFE is obviously the safest. The BAT-SAFE did a fantastic job containing the flame and heat and is the only option that even tries to filter soot. In addition, its design encourages you to use it correctly and helps prevent unsafe charging by accident or forgetfulness. It is the most expensive option, but at $60 it should hardly break the bank. If you have no option but to charge inside your home, this is the only option we would consider. What you should use to contain your batteries depends heavily on how large they are and where you store them, but one thing is absolutely certain: do something! 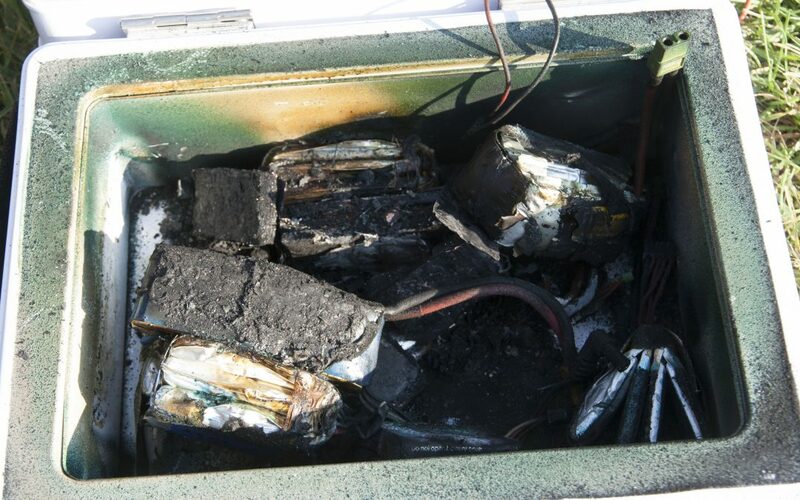 These batteries do pose a risk that every user should be aware of. Take the necessary steps to protect yourself. 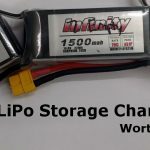 Lipo storage voltage – how much does it matter?